Indulgent Tormentor is definitely not as useful as Bloodgift Demon , true it saves the 1 life, however, it doesn't guarantee the draw, and isn't under your control, which for me adds too much randomness, reducing the overall consistency of play. If you're delayed, mana screwed, or have no A/D/D in hand with a Kaalia of the Vast ready to go, opponents recognize your stalled, and will continue your agony for 3 life. Perhaps if you have an Alliance, or there is an opponent low in life you can target, then you may be able to ensure the draw, but it is highly situational. In cases where an opponent is sacrificing a creature to prevent your draw, it won't be a creature that matters to the board state anyways, they would rather just let you have the draw. Too much uncertainty to protect the 1 life, I would rather pay 1 life and guarantee the draw. If an opponent is low life, our I'm 1 damage output that turn shy of killing them, or they are tapped out and I need my life for other tutors, I can always target an opponent, surrender my draw to them, and do the 1 damage to an opponent. Doom Whisperer is a very powerful tutor, he can recursively (assuming you have life), dig through your library, throwing, Kiki-Jiki, Mirror Breaker , Restoration Angel , and Karmic Guide into the graveyard (at the end of an opponents turn), then puts the Reanimate or Animate Dead ... etc. ontop of your library to draw on your turn, and win! If you do happen to Surveil into something that you can't afford to lose, like a Reanimate or a Animate Dead , something like that, stop Surveiling, draw, then continue Surveilling on your turn pre-combat main phase. 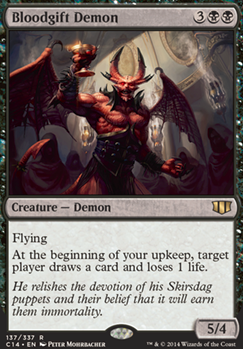 Sure Doom Whisperer is no Razaketh, the Foulblooded , but he doesn't have the downside of the sacrifice, and he is CMC5, so he can potentially win you the game cast from your hand, + ( Reanimate ) is a plausible turn 4/5 alt. win-con if you get the right Surveil. Often I'll surveil to a Tutor (Like Buried Alive ), or to a game changing A/D/D like Master of Cruelties or Iona, Shield of Emeria ... etc. 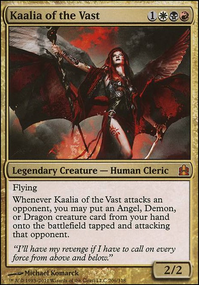 in cases where I have Kaalia of the Vast ready to attack on my turn. I would avoid the uncertainty of Indulgent Tormentor , stick to a sure thing. If your finding your games are going longer and need more life, you can always augment on the Lifegain/Lifelink strategy, I have quite a bit built in, but there is more, like a Vault of the Archangel as one example. Nearheath Pilgrim would be another I can think of off the top of my head. I used to have more but with EDHREC.com being so popular I removed many of my suggestions. DMFF thanks for the feedback. I'm gonna try replacing Pitiless Horde and Blood-Cursed Knight with Ammit Eternal and Bloodgift Demon . If you see this deck change permanently, then you are the one to thank. Really cool deck idea. I think Pitiless Horde could be replaced with some better early game creatures since it doesn't really synergize that well. Knight of the White Orchid could help with some ramping if you adjust your landbase accordingly. Bloodgift Demon is a good card for your strategy and can net you some card draw. Dark Confidant or the cheaper Pain Seer could be good options for early game card advantage as well. Either way, neat deck. +1 from me. Wow, that combo is neat! I may try it one day, actually I already have Havoc Festival in my collection! You're right, I lack small creatures, so I'm considering addition of more Rakdos-enabling possibilities. Often I ramp pretty fast, so casting 5 or 6-mana-cost creatures isn't a problem. I also have a lot of draw to help me drawing more or less anything I want! In my opinion there is no such thing as too much mass removal :D It's just too good when your opponents are faster than you. Let me introduce to you my favorite rakdos combo Havoc Festival + Wound Reflection . With this they have a turn to find an answer or the die. 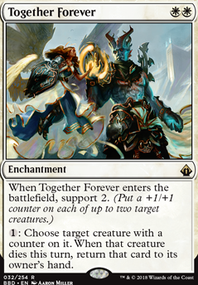 With the alternate win condition section I assume you aren't against them and this one has value when not together as well. For comments on the deck. You have no early game power creature wise. The smallest creature you have is Solemn Simulacrum . Considering you have alot of rocks and ramp it may be ok. 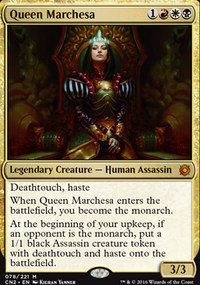 But to me it looks like you want to act fast and you have like 3 card that can get the damage in to allow you to cast Rakdos, Lord of Riots . Which is what helps you cast end game spells. Many people try to solve stuff like this with Earthquake like effects, or if you are desperate Curse of the Pierced Heart . You can also lols people with Pestilence or similar effects. 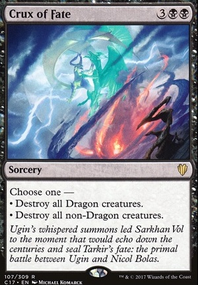 As you can essentially use it to fulfill Rakdos, Lord of Riots damage opponents requirement, then you can use it to effectively pay 1 Black Mana to reduce the cost of your creature spells by 3. I would be careful with all the field wipes, you have many great creatures and field wiping alot is counter productive to that strategy. I would replace the field wiping demons to Bloodgift Demon and Indulgent Tormentor instead, as they would be great adds to the deck as the could fulfill the damage requirement and give you card advantage. I would Personally try adding in Xantcha, Sleeper Agent , as it is card draw and while it is out you can pay 2 extra to cast Rakdos, Lord of Riots . 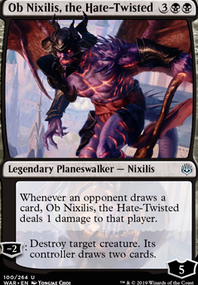 Following the game plan of Rakdos, Lord of Riots you should think about Neheb, the Eternal as well, as it plays the game of damaging people to get "Mana" to cast big spells. A surprise card you can get people with is Mana Geyser as it can easily get you like 12-17 Mana on turn 5 in a standard commander game (4 people).